Prairie Moon is a beautiful butter white couloured, semi double hybrid. The flowers are large and get fuller every year older with stiff stems and strong foliage. Prairie Moon is blooming early just like the other hybrid butter whites. Our customers rave about it. Prairie Moon is rarely offered. 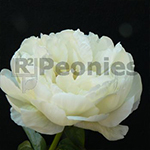 This Peony is suitable for cut flower use as well for landscaping in gardens and city parks.